It is one of the most iconic and recognizable sports calls in history, from out of the mouth of Al Michaels and it perfectly summed up the feeling going on in 1980 as the USA Hockey Team, stiff underdogs, defeated what was the most dominant and unbeatable hockey team in the world, the Soviet Union. The “Miracle on Ice,” as if became to be known, is one of the most amazing moments in US sports ever. 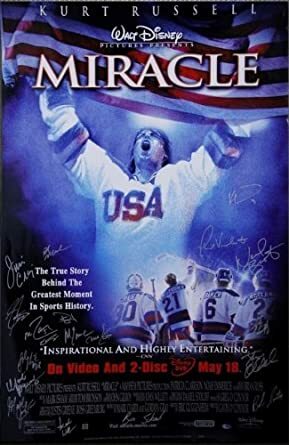 The movie that follows this team to that iconic victory may not be as stunning as that game, but it does a great job of showing us the effort and the agony the men of that hockey team put themselves through to compete in the Winter Olympics in Lake Placid. Head Coach Herb Brooks (Kurt Russell) compiled a team of players, not on who was the best players, but on who could form together to become a team. His coaching techniques could be seen as inappropriate, but the players wound up buying into the psychological methods employed by Brooks. He was able to inspire these men to give their absolute everything and he demanded that nothing short of that was acceptable. The scene of the players being “conditioned” after a tie prior to the Olympics is one of the hardest scenes to watch in the movie. I’m not sure that this kind of coaching style would fly in the world of athletics these days. The movie is your basic sports biopic with the same typical sport beats that a sports movie uses. It is not like the movie does anything original or special in the telling of the story. Kurt Russell is solid as Herb Brooks and Noah Emmerich as assistant coach Craig Patrick provides the counterbalance to the apparent insanity shown by Brooks. What makes this different from other sports biopics is that the film has the benefit of being about one of the most inspiring and goosebump raising events in sports history. The call from Al Michaels is amazing and I dare any true American to watch this without, at the very least, swelling up with national pride. I had tears in my eyes as the games vs. the Soviets came to its conclusion and you cannot help but be affected. It is such a powerful moment that it helps elevate the film prior to it. Kurt Russell and the game are the stars of this movie and it is well worth the time to watch it despite being fairly common in way of movie.